Royal Botanical Gardens' historic Rock Garden was opened in 1932. It was given a significant rejuvenation 2013-2016 and is open once again. Royal Botanical Gardens is Canada's largest botanical garden on the basis of its land holdings. It was founded in the 1930s as a combination of cultivated gardens, parks in the City of Hamilton, and protected natural lands. Most of the land area of RBG is located within the city limits of Hamilton, while RBG Centre, with its administrative, research and cultural functions, is located in the west end of neighbouring Burlington. As directed by its provincial mandate, since 1941 RBG developed in the 1950s and 1960s into a centre of excellence in both horticulture and the management of natural areas. It has extensive educational programs and serves as an outdoor laboratory for scientific research. More than 25,000 children per year participate in formal education programs, many based at the Nature Interpretive Centre in the RBG Arboretum. - The Rock Garden which displays spring bulbs, perenials, spring flowering trees and conifers. - The Laking Garden holds the major perennial collections including irises, hostas, grasses, peonies and a heritage plant collection. - Hendrie Park features collections of roses, lilies, native plants, woodland plants, medicinal plants, scented plants and annual trial beds. - The Arboretum collections include majestic avenues of trees, ornamental trees and shrubs, and a magnolia collection. Of particular note is RBG’s signature lilac collection which is one of the largest and most diverse lilac collections in the world. RBG is also the International Registration Authority for Cultivar Names of Lilacs in the Genus Syringa L. (Oleaceae). RBG's nature sanctuaries contain one of the most significant and best-studied regional floras in Ontario. Continuing to monitor and conduct field botany in these properties is crucial to managing the institution's natural lands, for interpreting them for the public, and for understanding patterns of plant distribution. Present research programs include plant systematics and taxonomy, ecological restoration, field botany, wetlands management, species-at-risk management and recovery, and horticultural taxonomy of hybrid lilacs. 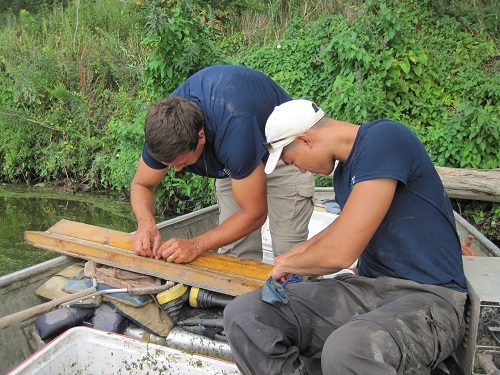 Most research is centred on the stewardship and restoration of RBG's natural lands, especially wetlands and threatened terrestrial habitats and plant species. The RBG Herbarium, known internationally as "HAM," supports the institution's research activities and is critical to the generation of its knowledge-based products. HAM is an archive of the last 50 years of floristic exploration of southern Ontario and is also important as an international collection of cultivated plant specimens. In total it comprises 80,000 specimens. It includes approximately 15,000 specimens collected within RBG's own properties and the immediate area, and forms the basis for a published checklist of plants growing within the natural lands. The RBG Library and Archives have provided research support to both RBG staff and visiting researchers, through extensive serials and monograph collections in horticulture, botany, zoology, garden history and design, landscape architecture and gardening, for nearly 50 years. The Centre for Canadian Historical Horticulture Studies contains one of the largest historical collections of Canadian and international nursery and seed trade catalogues in Canada, as well as the papers of Isabella Preston and other Canadian horticulturists and botanists. The collection also contains a wide variety of ephemera relating to the gardening and horticulture industry in Canada and parts of the United States. The unique focus of these library and archival collections allows RBG to serve as an important centre supporting in-depth research on the development and management of botanical gardens and horticulture trades in North America. Special Collections:The focus of the living collections is based upon ornamental cultivated plants with a small subset of plants being of wild origin and having ex-situ conservation value. As a result, the horticultural work taking place within the living collections is centered upon horticultural research and science, trials and evaluation, education and horticultural display. For a plant to be accessioned within a collection it must have taxonomic, geographic, horticultural, morphological, display, economic, thematic or conservation significance. ·The Helen M. Kippax garden interprets how the native plants of southern Ontario bring ecological function, biodiversity and sustainability to gardens. ·Veggie Village: 100 Mile Produce Gardens encourages visitors to eat vegetables produced locally in keeping with the one hundred mile diet and promotes ideas on food security, plant biodiversity while empowering visitors to engage with ways of reducing their carbon footprint. ·The Aldershot Escarpment Garden provides the opportunity to interpret the diversity of the local landscape, in particular the Niagara Escarpment (designated a World Biosphere Reserve by UNESCO). An ex-situ group of approximately 70 Wood-Poppies (Stylophorum diphyllum - Listed as Endangered in Canada) has been established for experimental and monitoring purposes in a secluded natural area. This group is being monitored by the Wood Poppy Recovery Team and is part of a population genetics study of the species and its status in Canada. Royal Botanical Gardens (located in Hamilton and Burlington, Ontario, Canada) owns and manages approximately 2,400 acres of protected nature sanctuaries at the western tip of Lake Ontario. Although within an urban landscape, these lands include some of richest habitats in Canada for diversity of plant species (c. 1,160 species recorded to date). Included in these sanctuaries are extensive wetlands and forests, savannahs, cliff-face ecosystems, and some remnant prairies. These lands include some old-growth communities in deep ravines, but much has been disturbed over the past two centuries as farms and then towns have grown up around them. Protection of this complex landscape began in the 1880s with designation of some wetlands as protected fish habitat. Much more was protected in the 1920s with the declaration of Cootes Paradise Marsh as a bird sanctuary and the purchase of hundreds of acres from developers by the Hamilton Board of Parks Management. Since the establishment of Royal Botanical Gardens in the 1940s the restoration of Cootes Paradise Marsh and its surrounding habitats have been a major priority for the institution. The wetlands have suffered from three main stressors: nutrients and other pollutants from urban sources, water levels being artificially elevated to facilitate shipping on Lake Ontario, and the effects of introduced, invasive species. Restoration strategies have included three main actions: improvement of water quality entering the wetland (largely through improvement in municipal waste water treatment), reduction of damaging invasive species (through various strategies to reduce or eliminate invasive fish), and revegetation of specific areas with native aquatic plants of locally-appropriate genetic provenance. Royal Botanical Gardens’ own work has included leadership on the invasive species and revegetation efforts. Cootes Paradise Marsh is one of the last remaining major Great Lakes coastal wetlands; critical fish spawning and bird habitat. In the 1940s introduced carp (Cyprinus carpio) and related goldfish and hybrids were identified as being highly damaging to aquatic vegetation. Spawning females entrain sediments in the water column, preventing photosynthesis and eliminating native aquatic vegetation. Many different tactics were attempted to remove carp from the 600 acre wetland, including various traps, nets, and fishing strategies. In 1997 the Cootes Paradise Fishway was brought into operation, which straddles the only connection between the very shallow marsh and deeper waters attached to Lake Ontario. The Fishway is operated by Royal Botanical Gardens, essentially an integrated pest management project directed at protecting the vegetation of Cootes Paradise. All fish wider than 5 cm are captured and manually sorted by RBG staff. All carp are turned back to Lake Ontario; all other species are allowed to move in and out of the marsh, but are monitored. 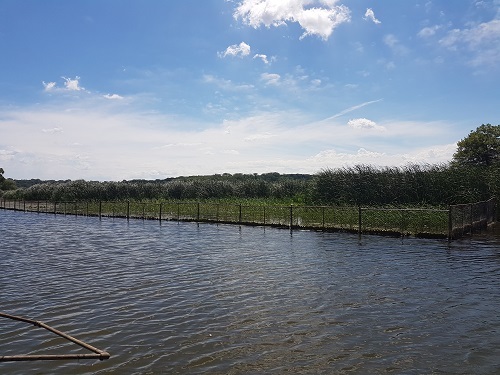 This system has resulted in greater than a 90% deduction in the carp population in the marsh, with significant recovery of aquatic vegetation the result. In addition to controlling invasive fish, significant replanting of aquatic vegetation has been undertaken in appropriate areas of the marsh. 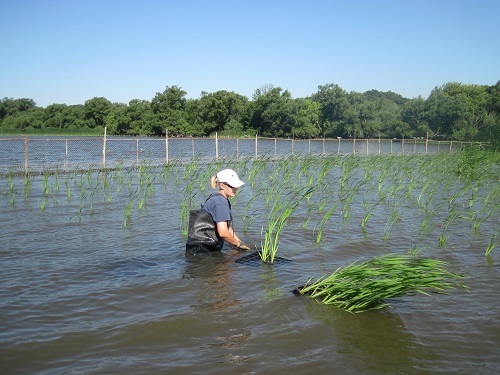 Revegetation efforts have included several species such as southern wild rice (a dominant species in the wetland prior to 1,000 CE), cattails, and white water lily. Planting projects include working with an extensive school program called the “Mini Marsh Program,” implemented by RBG and partner agencies. School classes are given planting trays and seeds of aquatic plants, which they grow during the school months. Grown trays of plants are then returned to the marsh and planted. In addition to protecting the aquatic vegetation from introduced fish, newly planted areas must be protected from the large population of native Canada Geese at the wetland. Effective protection measures include erecting temporary fences that prevent geese from landing and approaching young plants. Once stands of mature vegetation are established, the fences can be removed. These revegetation efforts have resulted in the restoration of 90 acres of wetland since the 1990s. Significant improvements in the diversity of other taxa have been noted since these programs have been underway, including recovery of fish and amphibian populations also. These programs are part of the overall efforts to restore the ecosystems associated Hamilton Harbour, into which Cootes Paradise Marsh drains. The restoration of Cootes Paradise Marsh is a key component in the multi-agency Remedial Action Plan for Hamilton Harbour. More information about Royal Botanical Gardens and their habitat restoration projects is available online at: http://www.rbg.ca or contact Tys Theysmeyer.